Nearsightedness is on the rise in the United States. Myopia is getting worse around the world. In the United States, myopia has increased 66% in thirty years so that now 42% of people aged 12-54 are myopic. Children accounted for 10% with Asian children having the highest percentile of 18%. Unlike traditional soft contact lenses, gas permeable contact lenses are custom-fit, based on the exact measurements of your eyes. Nearly anyone who is dissatisfied with their vision with off-the-shelf soft contacts may be a good candidate for GP custom contact lenses. 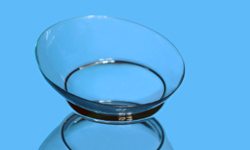 Custom GP lenses can be designed to fit unusual corneal surfaces. They are an excellent option for individuals with keratoconus or unusual corneal curvature caused by eye injury, natural causes, an unsuccessful LASIK procedure or other corneal refractive surgery. For patients who have become presbyopic, custom GP lenses is the preferred choice for multifocal contacts allowing for near, intermediate and distance vision. Recently, orthokeratology designed custom GP lenses are emerging as an effective, non-surgical treatment of myopia and astigmatism. Custom GP contact lenses made from OPRI polymers offers a broad range of features and benefits allowing your eye care professional to design a lens that meets your precise needs. If you have never considered wearing contact lenses or have been previously told you are not a suitable contact lens wearing candidate, now is a great time to revisit this option. OPRI’s family of innovative gas permeable contact lens polymers are formulated to offer improved lens comfort, wetting, deposit resistance and overall performance. OPRI polymers are crafted into custom designed and custom fitted lenses to provide you with crisp, clear vision that are more durable and longer lasting than soft contact lenses. In addition, OPRI GP lens polymers offer better protection of your ocular health versus soft contact lenses by allowing more oxygen to reach the surface of your eye. Depending on your vision requirements, your eye care professional has a choice of a wide range of oxygen permeable polymers... Ask your eye care professional about which of the OPRI premium polymers is best suited to meet your needs. View Package Inserts for OPERMTM F60 and OPERMTM 30. NOTE: Learn more about GP contact lenses from the GP Lens Institute's patient education website. It includes information about multifocal contact lenses, options for astigmatism, correction of keratoconus and much more. Exciting polymers to correct vision in ways we’ve only begun to imagine.